Dehumidification is possible using two possible principles, Condensation with refrigeration style dehumidifiers and Adsorption with desiccant dehumidifiers. Desiccant dehumidifiers perform exceptionally well when used in cooler climates, or when a low dew-point, deep drying or low humidity levels are required. Since desiccant dehumidifiers do not produce water, they will work effectively down to sub zero temperatures. 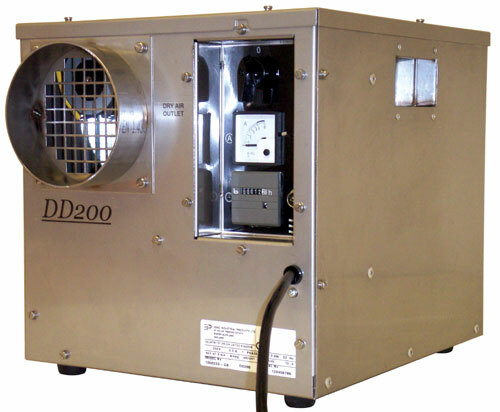 We offer a range of Commercial EIPL Desiccant Dehumidifiers including models DD200, DD300, DD400. Depending on the environment Ebac Desiccant Dehumidifiers can lower humidity to 4%rh. We also supply a Remote Humidistat for accurate control. Their operation is simplistic yet extremely effective and reliable. Air (Process Air) is drawn into the dehumidifier, where is passes over a wheel impregnated with Silica Gel. As the air passes over this wheel, any moisture present in the air, is absorbed into the Silica Gel wheel before leaving the dehumidifier as warm dry air. The Silica Gel wheel is continually, slowly rotating, typically at three revolutions per hour. As the wheel rotates a small portion passes through the regeneration segment. During this phase a second air stream (Regeneration Air) is heated to a high temperature before passing over the wheel. Any moisture present in the wheel is released into this air stream, this hot wet air is then exhausted outside the area being dried. Ducting - Circular spigots on the machines allow for easy connection of flexible or rigid ducting. Ducting should be as short as possible for maximum efficiency.